On October 26, 17 devoted and fun-loving Northfielders gathered at Tracey Briscoe’s in Montreal for the first Planning Meeting of the year, and the main topic was the choice of a theme for June 2014. We spent 4 hours of fantastical, productive and fascinating time discussing what is important to us and our Community, and working through a list of proposed theme ideas that numbered over 85 individual phrases. It is a unique experience, something Kathy and I look forwards to each year. Where else in the entire world can you engage in this kind of discussion, with people that care, who listen, who are brave enough to talk about what matters, and who can reach consensus about such huge philosopical and personal issues? 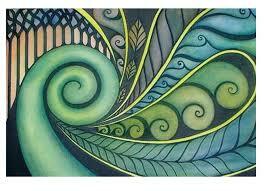 Stemming from New Zealand, KORU is a Maori art symbol of creation, based on the shape of the unfurling fern frond. The symbol speaks to new life, nature, unfolding, perpetual movement, strength, and growth. While growing, there is connection with the concepts of resiliency, struggle, protection, expanding, and spiral. Finally, when manifested fully, there is community, spirituality, unity, peace, and the notion of returning to the origin and always recalling from whence we came. We have learned that in the Maori culture of New Zealand, a KORU symbol is often carved on a small disk of bone and made into a necklace pendant. People wear these for a period of time and allow the oils from their skin to penetrate the bone. The bone will take on more of a yellow color over time. Then one gives their KORU pendant to another, symbolizing a gift given from your true self. This thought is inspiring. Perhaps there’s a workshop in there somewhere…. We feel that this theme and symbol will be rich in helping to lay a platform where Conference Hour speakers can speak of their “unfurlings” in life. And thanks Carolyn for noticing that KORU spelled backwards is: U R O K (you are OK)!